With heavy hearts, we relay the news of our patriarch, Duane’s passing this January. In the midst of grieving his unexpected death, our family has been surrounded by many, many friends. We are so very blessed and truly grateful for your friendship, support and love during this difficult season. Milford Duane Jenkins was born to Laverta Crail Jenkins and James Milford Jenkins on July 28, 1934 in Shattuck, OK. He came to join his brother, Donald Ray who was just 18 months older. The family lived in the Catesby, OK area where Milford farmed. The boys went to school in a small, one-roomed school house near Catesby and later transferred to Luther Hill School. In 1943 Milford and Laverta bought a farm 8 miles north of Shattuck. Duane and Donald started to school in Shattuck in the 4th and 5th grade. In 1946 the boys were joined by a little sister, Carol. Duane was 12 and spent a lot of time taking care of Carol while his mother and dad worked on the farm. He loved his little sister very much. They all continued school at Shattuck and Duane graduated in 1952. Throughout school the boys were very active in FFA, showing steers and heifers primarily. In 1952, Duane presented the Reserve Grand Champion steer at the Oklahoma City Stock Show. Duane and Donald started in the Angus business in 1948 with heifers they bought with their dad’s help. Both have stayed in this industry continuously since that time… approximately 70 years. After graduation from High School, Duane went to Oklahoma A & M. He graduated in 1956 with a degree in Vocational Agriculture Education. While at college, Duane met the love of his life, Donna Ball of Laverne, OK. They were married June 24, 1956. Their first home was Fargo, OK where Duane started his Vo Ag teaching. He enjoyed this profession for the next 9 years. While in Fargo, three sons were born, David Duane born June 9, 1957, Dale Wayne born June 6, 1960, and Daniel Paul born April 17, 1964. In May 1965 Duane attained a lifelong dream of owning his own ranch. He and Donna bought the ranch south of Higgins, TX and have enjoyed being a part of that community for 54 years. They raised Angus cattle and the business evolved into hosting their first Production Sale on the ranch in 1995. Duane and Donna both found great enjoyment in meeting and getting to know people who are involved in the Angus cattle business. Over the years, Duane was willing to serve on several boards. Commissioner Eddie Detrixhe appointed Duane to the Hemphill County Hospital Board and he served several terms in this capacity. Duane was active on this board when the county built the new hospital in Canadian. Duane was also elected to the Farm Credit Board of Western Oklahoma in the early 1980’s. He served for 19 years with this group and made many friends in the process. Duane was a member of the Higgins United Methodist Church and attended various other small churches in the Shattuck and Catesby area while growing up. He was baptized in the Methodist Church in Fargo in about 1957. Duane is survived by his wife, Donna of the ranch south of Higgins, three sons and their wives, David and Cindy of Goodwell, OK, Dale and Brenda of the ranch south of Higgins, and Daniel and Jackie of Turkey, TX. Grandchildren include: Will Jenkins of Tulsa, OK, Sarah Jenkins of Stillwater, OK, Kayla and Bobby Gregg of Canadian, TX, Katie and Caleb Whittington of Canadian, TX, Kari Jenkins of Stillwater, OK, Karley and Preston Deal of Shattuck, OK, Jordan and Clint Cockrell of Midland, TX, and Kristen and Seth Mahan of Welch, TX. Duane is also survived by 6 great-grandchildren, Samuel and Lily Gregg, Walter and Bee Ellen Whittington, and Creed and Mae Cockrell. Also, he is survived by a sister and her husband Carol and Danny Ratliff of Chandler, TX and a brother and his wife, Donald and Judy Jenkins of Shattuck, OK. Duane is leaving behind many nieces and nephews and a multitude of other friends. Memorials may be made to the Higgins United Methodist Church in care of Shaw Funeral Home, P.O. Box 276, Vici, OK 73859. So much of the ranch’s identity is wrapped up in our friends and family and the stories that bind us all together. 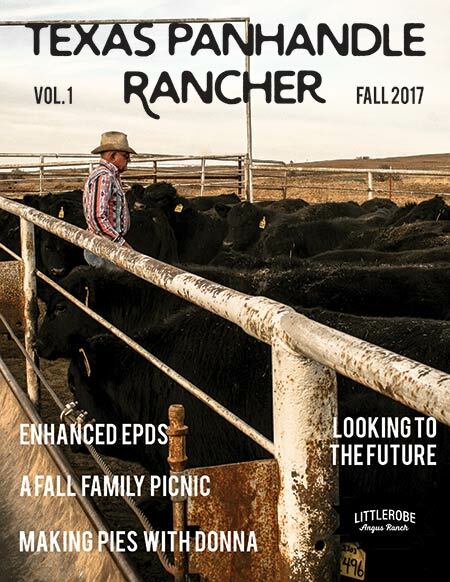 One of the ways we love to share this with you is through our new online magazine: Texas Panhandle Rancher. In this magazine, we want to highlight not only our family’s stories but your stories as well. We share recipes, family traditions, our history, and up-and-coming ideas and techniques to help you grow your herd and your profit. For more information or if you have questions, shoot us an email at: littlerobeangusranch@gmail.com. We’d love to hear from you!